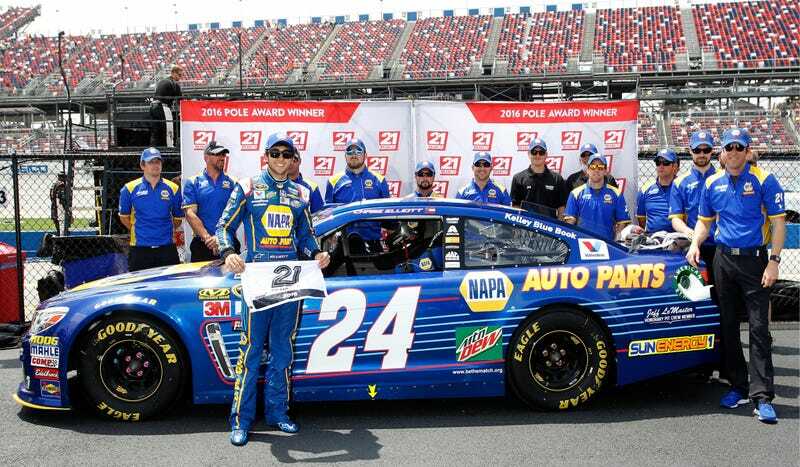 If you ever want to feel as if you’ve wasted away your sad, underachieving life, take a look at Chase Elliott, the pole sitter for this weekend’s GEICO 500 at Talladega Superspeedway. The 20 year old gets to wave that underage flag high for winning pole on his first trip to Talladega in a Sprint Cup Series car. Coors Light sponsors the pole award in NASCAR, but the company brings out an alternate “21 means 21" motif for young pole sitters. Either way, his pole-winning lap of 192.661 mph is an impressive result for one of NASCAR’s youngest stars, especially considering that he won pole at the Daytona 500 earlier this year, making this his second restrictor-plate pole in a row. This is Elliott’s rookie full-time season in Sprint Cup. Even cooler? Elliott’s dad Bill Elliott sat on the pole at Talladega exactly 30 years ago. Another up-and-coming Sprint Cup driver, Austin Dillon, qualified right behind Elliott for tomorrow’s Sprint Cup race. Defending spring Talladega and six-time race winner Dale Earnhardt Jr. will start from third. As for one of the most experienced drivers in NASCAR, Tony Stewart is still recovering from a back injury sustained in the offseason. According to NASCAR, Stewart’s doctors didn’t want him participating at all this weekend, however, he talked them into letting him start tomorrow’s race. Ty Dillon, who qualified in Stewart’s place today, will then take over, but Stewart’s start tomorrow gives him a few needed driver’s points. Full Talladega Sprint Cup results can be found here.